The capacitors are specially designed for A.C. mini motors and electrical apparatus. Adopt metallized polypropylene film or metallized polyester film which has excellent electrical characteristic, made with newest technique and strict quality control. 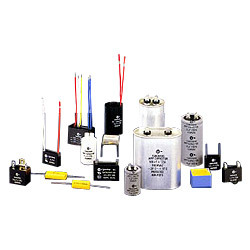 Capacitor has the advantages of minimal size, lightweight, low loss, high insulation resistance and high security. Applicable to air conditioning machines, refrigerators, washing machines, ventilating fans, electric fans, motors, fluorescent lamps and mercury lamps, etc. For starting and power factor correction purpose. 1. Standards: CNS, 4327, JIS C4908, IEC 252. 2. Capacity tolerance: (K)±10% (U) +10%--5% (J)±5%. 4. Insulation resistance: terminals to case (above 2000 M.Ω). 5. Voltage withstand: (1) Between terminals: W.VX1.5-One minute. (2) Terminals to case: W.VX2+1000 (min. 2000)-one minute. 6. Dissipation factor: (1) MF type: below 0.3%. (2) MPP type: below 0.1%. 7. Range of temp: (1) MF type -25℃~+55℃. (2) MPP type -25℃~+70℃. (3) MPP type -40℃~+85℃. 8. Sealing test: heating in 75±3℃ (90±3℃) for 15 minutes should not leak oil. 9. Continue life test: 1.25 x rated voltage 600 hours. 10. On-off life test: W.V x 140% (ON 2SEC / OFF 2 SEC), test cycle 100,000±1,000 times.